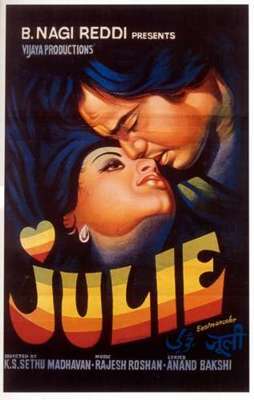 Bhool Gaya Sab Kuch is, admittedly, painful; I would expunge it from my soundtrack memory if only “Juliiiiiieeeee-aaaa-aaa-aaa-aaa, Julie loves youuuuuu” wasn’t so tonally traumatic. That’s the music, then. Onto the film. My experience of watching Julie was of being curiously transfixed by a film that is, in many ways, irritating. The film is a confection of Laxmi, pouting and polyester. It’s hard not to want to reach through the screen and shake the eponymous lass, then sit her down to explain about birds, bees and birth control (and also that an A-line minidress and platforms is tremendously unflattering). Julie gets her polyester knickers in a twist over Shashi, after seeing him in polyester sportswear. She lacks the ability to have a sensible conversation with a boy, so resorts to the classic giggle-blush-hand-flutter. Shashi duly gets her drunk and plays her records; polyester drops (not on screen, though Shashi sleeping in bed and Julie with untucked shirt is pretty risqué by classic buttoned-up Bollywood standards). Next thing Julie’s up the duff and being packed off by her mother to have the baby on the hush-hush. “She’s gone to the city for a job”, of course. The whole messy pile-up is compounded by the class (caste?) politics of Anglo-Indian identity. Julie’s family are Anglo-Indians: they perform Englishness and dream of a ‘home’ they’ve never seen, while being, post-independence, increasingly marginalised. Julie’s father clings to a rubbish job on the railways, while drinking himself to an early grave and racking up debts on foreign goods. Her mother is miserable and obsessed with appearances; far better, she reasons, that Julie be forced into silence and adoption than marry a Hindu boy. The likeable character of the film is Shashi’s father, who is … well, sensible. He draws everyone’s attention to the idiocy of punishing teenagers for having it off across class boundaries. But somehow the happy ending is a little too saccharine. Because doubtless for most Julies life was never lovingly re-stitched; beneath the polyester, the scratches.